Provides 2.1X enlargement of the standard viewfinder. Clearer view improves manual focusing precision. Optional image inversion corrects view for instrumentation applications. Contains 5 fully-coated precision lens elements in 3 groups. 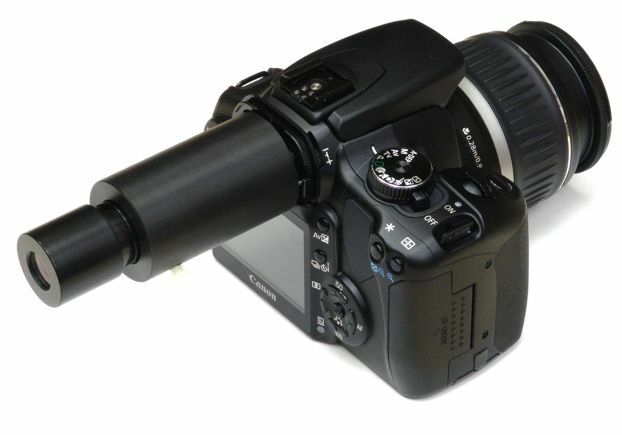 Provides 2.1X, wide-field magnification of standard viewfinder. 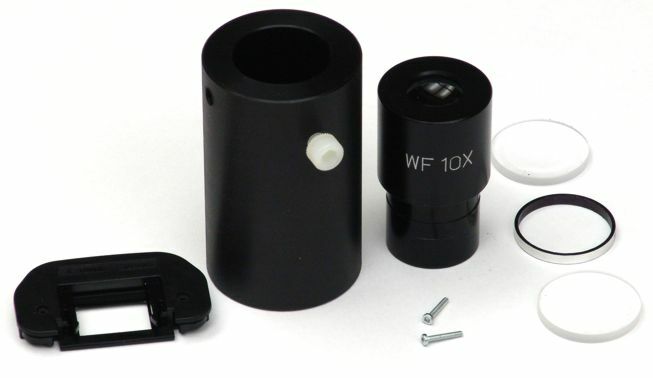 10X wide-field standard microscopic eyepiece with machined, anodized aluminum body. Uses Canon-compatible eyecup fitting for instant attachment to viewfinder and removal. 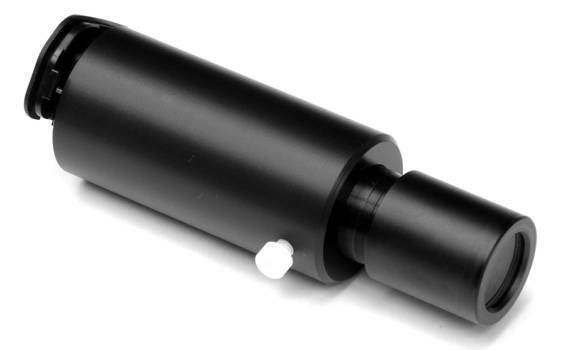 Precision machined, black Delrin body. Nylon thumbscrew for diopter adjustment of -5D to +5D via telescoping eyepiece mount. Kinematic 3-point mount provides accurate and stable attachment to camera. Thumbscrew adjustment maintains square angle to viewfinder (requires 5/32" hex wrench, supplied in kit). Sacrificial mount lowers risk of damage to camera body if the extension tube is bumped or camera dropped. 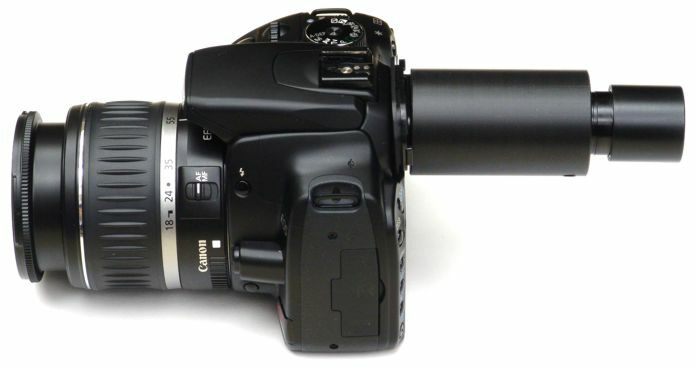 Disables camera's display-off sensor for manual control via [LCD auto off] menu item, on Canon models so equipped. Readily disassembles for thorough cleaning (requires T5 Torx screwdriver for objective cell disassembly, not supplied). Generous 18mm eye relief accommodates eyeglass wearers. Fits many Canon digital SLRs: 5D, 5D Mark II, 10D, 20D, 30D, 40D, 50D, Digital Rebel (300D), XT (350D), XTi (400D), XSi (450D), XS (1000D), T1i, and later models. Fits any other camera viewfinders compatible with the Canon eyecup "Ef" or "Eb". Overall length 4.4 inches (112mm, including eyepiece), diameter 1.5 inches (38mm). 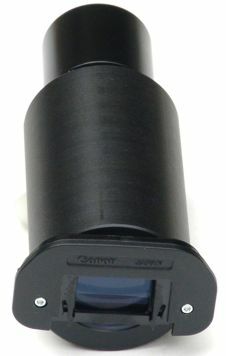 Special offset version with 1.8X magnification available for Topcon instrumentation applications. Other magnifications, lengths, and offsets available by custom order. Email inquiries below. Price: $500.00 plus $10 shipping to USA addresses. Ships in 2 weeks after receipt of order. 1-year limited warranty. Photo at above/left shows the magnifier mounted on a Canon Digital Rebel XTi camera, also known as the Canon 400D. The camera is not included. Important: This is an inverting magnifier for instrumentation applications. It magnifies the viewfinder view, but also rotates the image to be upside down. It is not suitable for ordinary photography, unless you want to look at (or can tolerate) an inverted view. Non-inverting version of the magnifier above. Same 2X optics as above, but also incorporates erecting prism for upright view. Overall length 4.8 inches (123mm), diameter 1.5 inches (38mm). One inch longer than inverting version above. Price: $750.00 plus $10 shipping. Ships in 2 weeks after receipt of order. 1-year limited warranty. I originally developed this magnifier for medical instruments which were being upgraded to use Canon digital SLRs. Many film camera backs used periscopic eyepiece viewfinders instead of the usual pentaprism focusing screen type, and thus the instrument image is inverted when viewed through a digital SLR. This magnifier inverts the inverted image again, for a net result of an upright image, when used on certain instruments. Canon seems to no longer make eyepiece magnifiers, such as the Magnifier R they made for the FD film SLRs, or the Magnifier S for the EOS film cameras. 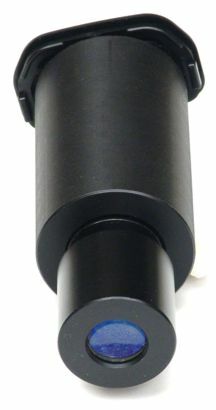 For normal photography, an non-inverting magnifier of this type requires roughly double the length, for the insertion of an inverting relay lens. The photo at the left shows the assembly from the rear, looking at the eyepiece. View of the front, showing the Canon eyecup which is modified to attach the scope to the Canon camera body's viewfinder. The assembly consists of these pieces. From left to right are: the Canon eyecup, the optical tube, the wide-field eyepiece, two miniature screws that mount the tube to the eyecup, and the objective lens (separate lens pair shown with spacer; current version uses a cemented 2-element achromatic lens). Side view of the magnifier on a Canon EOS digital SLR (Canon Digital Rebel XTi, or 400D). See also this mechanical drawing (542 KB PDF file). Have a comment or question on the Canon viewfinder magnifier? Need a quote on a similar custom-made instrument?